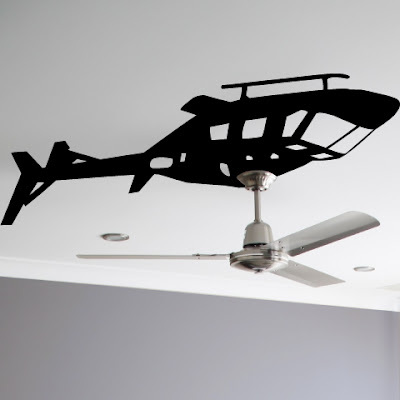 Helicopter Ceiling Fan Wall Decal Has Landed! 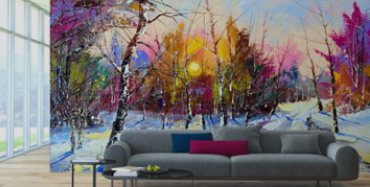 Prior to installation, we recommend temporarily removing the fans decorative trim cover. This can easily be accomplished by releasing the set screws and allowing the trim cover to rest on the fan motor while you complete the helicopter installation. The trim cover will be reattached after installation to complete the project (illustrated in the photo above). There is a 1" pre-cut hole and pre-cut slice on the roofs edge to allow the decal to install around the mounting rod. Installation Instructions (included with each order) will need to be followed to complete the decal installation. Be a comrade and share your installation photos with us on Facebook and Twitter.